You know when you watch a film or read a book, and you get a feeling you’ve seen something before? Almost as if the author has deliberately stolen an idea, trying to pass it off as their own? I’m no Harry Potter fan, but unfortunately I watched the first movie, and saw nothing other than a string of stolen ideas put together into a lacklustre story on a crash-course to nowhere. 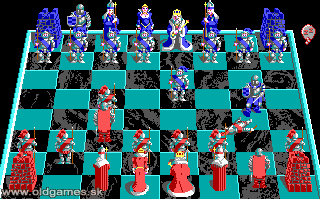 Most ideas looked to be lifted straight from the worlds of Roald Dahl, but there was one which I knew straight away was stolen from an old game by the name of Battle Chess. 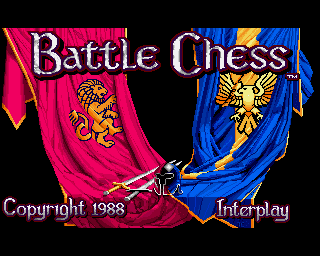 Battle Chess is a chess simulator. Chess has been around for years, and unfortunately there is only so much you can do with it. 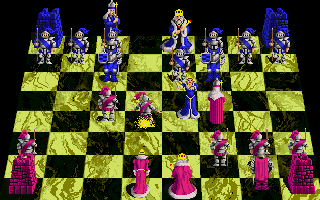 Computer simulations of chess have been available since Computers could first handle games simply because it’s one of the most instantly recognisable games ever, based on simple (ish) rules and parseable (I’m not sure if that’s a word, but it means can be “parsed”) logic. So, how does one chess game stand out against another? In the case of Battle Chess, it was simple. Bring the pieces to life. Let them fight for real. Before the gore and fatalities of Mortal Kombat were even a twinkle in the eye, this game brought dismemberment, cross-gender murder and even religious fights between Bishops, which probably could have caused ructions had it been more widely known. Assuming you have some knowledge of Chess itself, then you know that not much can be said about the A.I. or difficulty, and I’m not a good enough Chess player to be able to rate that. But what I do know is that the sometimes comical battles between the pieces make you want to play the game to try and see all the possible combinations. Let’s say you manage to locate this game and have a play of it… my advice to you is that my favourite battle, STILL, is Knight vs Knight, and if you’ve ever seen Monty Python and the Holy Grail, you’ll find it hilarious too. If only sampled speech had been available in those days. I’d have loved to have heard “’Tis but a scratch!” during that fight! If you’re a chess fan, chances are you might like this. If you’re not, there’s sufficient entertainment to encourage you to learn the rules just to try and see all the possible combinations of battles. Either way, for curiosity alone it’s worth a look.